Scientists and researchers agree: ocean levels are rising as ice from the polar caps melts. Rising sea levels will affect major cities within the United States in the next half-century, many of which are already struggling with infrastructure problems. Rising tides are expected to put parts of South Florida, New Orleans, and many other metropolitan areas underwater, especially San Francisco. 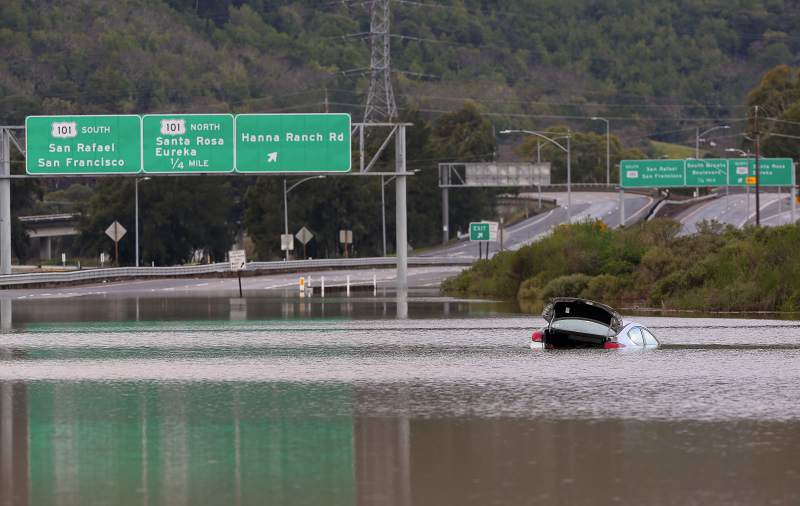 As tides already brush up against roads and freeways in the region, Bay Area infrastructure is prone to flooding, with two major arteries experiencing seasonal flooding: California State Route 37 (SR 37) in the North Bay between Vallejo and Sonoma County, and Interstate 80 in the East Bay north of Berkeley. Furthermore, San Francisco International Airport, surrounding areas in San Mateo County and Treasure Island are at risk. However, because climate change is a long-term issue, it is an easy issue for government officials to ignore in favor of more pressing problems. Especially with multiple unknowns surrounding costs and effects, and many competing political interests and jurisdictions, solving sea level rise infrastructure challenges can become quite difficult. There is extreme bureaucratic complication in a project that involves four counties, two cities, numerous regional transit and governmental agencies, state departments, and the federal government. The lack of coherence between these disparate groups is emblematic of projects across the county designed to mitigate the effects of sea level rise and other climate change-induced problems. Through an examination of SR 37 in the North Bay, this article evaluates the infrastructure challenges climate change poses, and why governments are failing to deal with them. SR 37, a 21-mile-long route that connects four counties, Marin, Sonoma, Napa, and Solano, is an important route for the region, and examining the plans for its improvement offers insight into the issues of managing infrastructure projects with a view towards a future with higher sea levels. The road is managed by California Department of Transportation (Caltrans), the state agency in charge of transportation; while each of the four counties it runs through play a role in its oversight and funding. The highway is an important connection for commuters, commerce, and recreational travelers alike. More than 44,000 vehicles traverse the roadway daily with commercial trucking making up four to twelve percent of traffic. It serves as a vital artery, connecting Marin County, San Francisco, and much of the Pacific coast including state and national parks with the inland Central Valley. It is also the main road to the Sonoma Raceway, connects the region to Santa Rosa and many Napa Valley wineries, and is listed as a State Recovery Route. With high traffic volume and only one lane in each direction during much of the stretch, traffic along the highway bunches up easily and often. As a result, Caltrans planners in Sacramento and at the local level along with UC Davis Road Ecology Center researchers are looking for a solution to alleviate traffic. Policymakers are struggling to decide whether to fix the short-term traffic problem or the long-term sea level rise problem. Short-term solutions that only look to fix the traffic problem may only worsen the long-term effects on the environment and the effects of sea level rise on the roadway. For example, one possibility is to widen the road into a four-lane highway where it is currently a two-lane road. However, a solution of that manner may lead to increased use, thereby increasing traffic and mitigating road-widening benefits. More importantly, merely doubling the capacity of the highway without doing anything else would do nothing to prevent future flooding and damage the environment. Conversely, one proposal from the UC Davis Road Ecology Center addresses sea level rise by raising and widening the road. Raising the road would allow the wetlands to thrive beneath the highway. Horizontal levees, usually referred to as wetlands, reduce the effects of sea level rise much like vertical, traditional levees, as demonstrated by a project in the South Bay near San Jose. The UC Davis proposal would cost Caltrans and local taxpayers billions of dollars, and with countless stakeholders, a project of this magnitude is seen as a long-term proposal that would take decades to study, fund, and complete. According to the Transportation Authority of Marin, one of the main stakeholders, the next steps in order to make a fix reality would be first to do a Financial Opportunities Analysis, followed by creating a specific project definition and outreach, and then to secure funding for Environmental Impact Statement. Only then, once some red tape has been completed and funding secured can the project actually move forward. To figure out why government officials should spend billions of dollars, a cost benefit analysis of the road and potential improvements is necessary to evaluate whether or not the road is a worthwhile investment to the state, local agencies, and taxpayers. The economic effects of SR 37 are difficult to measure; however, by analyzing the use of the road, it is possible to evaluate the financial costs to the region if the roadway were flooded seasonally or permanently. The economic value of SR 37 can be measured in two intuitive ways. The first is the flow of general traffic for commuters. The second would be the commercial stream of durable and non-durable goods that the highway can support. Creating projections for the economic value of these two facets is difficult and can often be over or under projected. As a result, planners and researchers have struggled to effectively capture the value of SR 37. A secondary route south of SR 37 connects the East Bay and the North Bay via the Richmond-San Rafael Bridge, but that route does not and could not completely serve the same traffic from SR 37. As water currently laps against the shoulder, it is clear that SR 37 must be improved and rebuilt. Because SR 37 spans wetlands, a restoration and expansion project would require building an elevated highway thus diverting traffic and creating more chokepoints, effectively creating high short run costs. These short run costs are offset by the long run benefits of the completed highway; however, those can be difficult to realize. The highway was initially built on a manmade berm that split the wetlands into two sections. The restoration of the wetland by removing the original berm and elevating the highway above the water level will minimize the effects of sea level rise on the highway and surrounding communities. Wetlands restoration can also serve a positive economic asset. A UC Davis study found that protecting the wetlands SR 37 encompasses provides up to $3.9 billion annual value to residents while holding a net asset value of up to $107 billion. The costs to fix the roadway completely are astronomical for a short, rural stretch of highway; one estimate sits at roughly $4 billion. Despite the high cost, the net value of the improvements is highly positive with up to $107 billion of added value for a mere $4 billion cost. Bay Area residents have approved taxes to mitigate the effects of climate change in the past. In 2016, voters approved Measure AA, a parcel tax for “bay enhancement and habitat restoration.” Voters in the four counties SR 37 affects could approve another tax to help fund the SR 37 fixes, or officials could make the stretch a toll road. Combined with state and federal funding, it is possible to raise and widen the highway, but so far nothing has happened. If the roadway must be fixed right now, why does inactivity persist; why has nothing happened? From an outsider’s perspective, raising and widening the highway in a timely manner makes sense. More people want to use the roadway than is currently possible, and rising tides are flooding the road. Raising and widening it would alleviate the effects of sea level rise and allow for more drivers. Yet neither of these things have happened and currently the improvements are projected to be completed in 2088. In 2088, it is possible the road will be completely underwater as ocean levels rise over the coming century. Every year over the past decade, drivers have spent hours stuck in nonmoving traffic on SR 37 and the road has been closed due to flooding for a week. And every year, a journalist from a local news outlet, be it the San Francisco Chronicle, Santa Rosa Press Democrat, or NBC Bay Area will write an article decrying the lack of improvements along SR 37. But so far, nothing has happened in large part because there are too many political players, all with oversight over SR 37. This inability to work collaboratively between agencies is not unique to the North Bay and California. Governments across the country seem unequipped to handle the problems climate change poses for infrastructure. Hopefully Bay Area leaders can figure out before 2088. Last modified on Oct. 30th, 2018 at 11:08am by Lisa Marie Patzer.